Eilish isn’t your run-of-the-mill pop-star. Her dark, brooding pop and distinct individual style attract others to her with ease. Eilish’s “I could care less” attitude shows that she isn’t trying to pretend to be anyone and puts her real personality on full display. The 16-year-old’s vocal range is nothing short of impressive. She effortlessly hits soaring high notes all the while growling through the moody lyrics, which perfectly accompanies her thick synths and rhythm and blues style beats. Her debut single, “Ocean Eyes,” went viral and has accumulated over 116 million streams on Spotify alone as of September 2018. 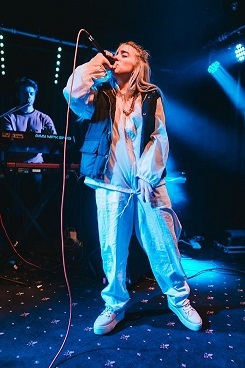 Her debut EP “Don’t Smile at Me” was released in August 2017. Following the EP’s success, Apple named Eilish as its newest Apple Music “Up Next” artist a month later in October 2017. Eilish shows how even though she is young she can do all the things that people who are older than her can do. She chased her dreams even though she was only 14 when she started her singing career. She inspires the current generations by being herself while having major success. Overall, Eilish has an amazing career and it is only getting better as she continues to inspire young girls all over the world to chase their dreams.